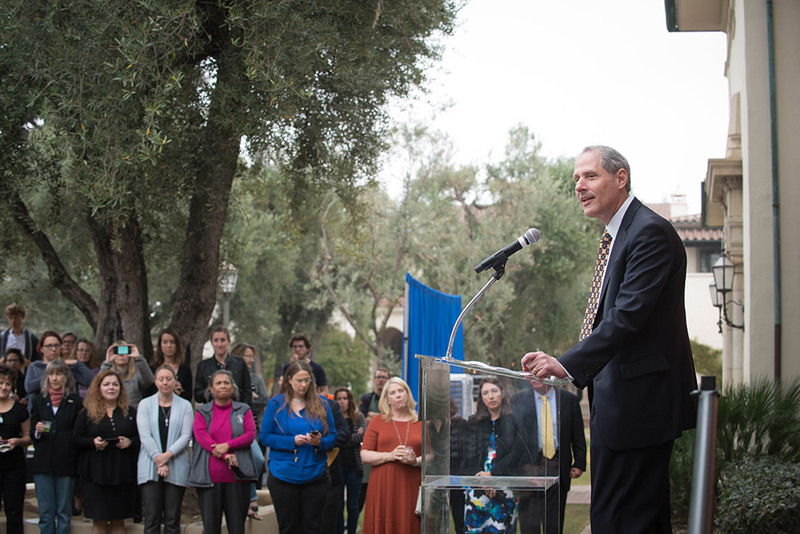 Many members of the Caltech community, along with local elected officials, gathered along the Olive Walk on November 8 to honor Frances Arnold, who recently received the 2018 Nobel Prize in Chemistry for the "directed evolution of enzymes." 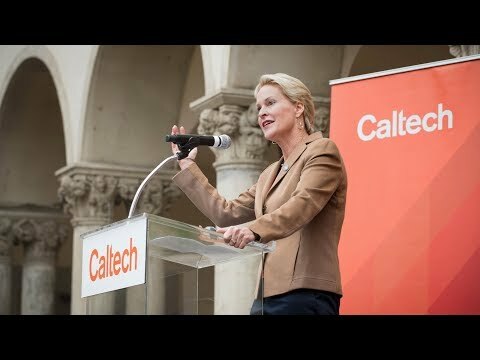 During the mid-morning ceremony, Arnold, the Linus Pauling Professor of Chemical Engineering, Bioengineering and Biochemistry, told the crowd she felt "incredibly lucky and grateful" to have worked for more than 30 years at Caltech—"a very small and special institution that made it possible for me to do the work that led to the Nobel Prize." Arnold, who is also the director of the Donna and Benjamin M. Rosen Bioengineering Center, added, "Only here could I convince students from very different disciplines—engineers, chemists, biochemists, molecular biologists, computational scientists—to throw their hat into this ring and this completely unexplored field, and contribute their creativity to this kooky idea that you could breed proteins like you can breed cats and dogs. And only here would I have been challenged to solve ever harder problems." "Today is a great celebration for Caltech," Jacqueline Barton, the John G. Kirkwood and Arthur A. Noyes Professor of Chemistry and the Norman Davidson Leadership Chair in the Division of Chemistry and Chemical Engineering, told the crowd honoring Arnold. "It's a celebration of science. It's a celebration of chemistry. It's a celebration of the Division of Chemistry and Chemical Engineering. It's a celebration of our students. … It is also a celebration for women at Caltech. Frances very much deserves this celebration." Addressing the crowd from the podium, President Thomas Rosenbaum praised Arnold, saying that she exemplifies "the qualities we hold dear: excellence, fearlessness, reinvention, seizing the big idea, trampling disciplinary boundaries, connecting fundamental understanding of nature to technological innovation. Her revolution in evolution has set the stage for new types of chemistries and greener pathways for chemicals." "We thank Frances for this excuse to party," he added, to applause and laughter from the audience, "but most of all for the joy that she brings to discovery."